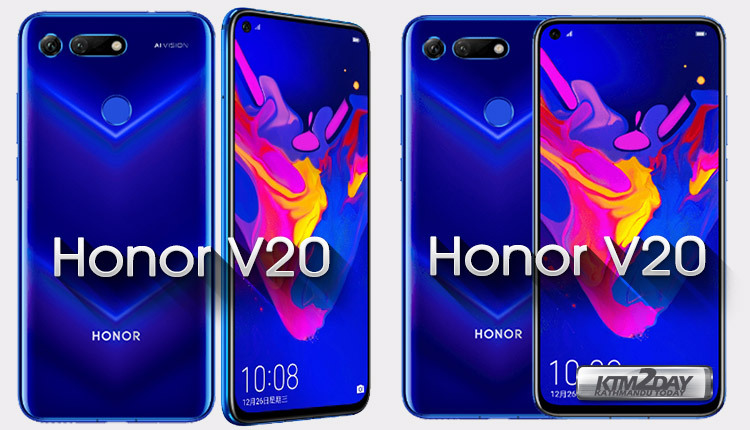 The Honor V20 has now officially unveiled in China today and is the company’s first display hole camera smartphone on the front panel. Amidst an event held in HongKong, the V20 was unveiled with features such as – All-View display, 48MP rear camera, Kirin 980 SoC and a new technology called Link Turbo. As mentioned earlier, the Honor V20 is the first smartphone to come with in display hole camera i.e. a small hole for the front selfie camera in the display screen .The company revealed this earlier this month on the same day Samsung announced the Galaxy A8s which also comes with a display hole. While Samsung calls its display the Infinity-O display, Honor is calling the screen on the V20 the All-View display. The display hole camera sits on the top left corner of the screen with a small cutout of about 4.5 mm in diameter.This hole will house a single 25MP selfie camera, thereby eliminating the need for a notch. The Honor V20 sports a 6.4-inch FHD+ (2310×1080) display. It is powered by an octa-core Kirin 980 flagship chipset, which is the same processor powering the Huawei Mate 20 Pro. It is Huawei’s first 7nm chipset that promises to deliver better performance and power efficiency over its predecessor. It also comes with Dual NPU for advanced AI and machine learning computation. This is coupled with up to 8GB of RAM for fast multi-tasking speeds and flagship performance. The V20 also supports GPU Turbo 2.0 that boost performance and graphical output while playing games. Additionally, it is also equipped with The Nine liquid cooling system, designed in an S-shaped to cool three core areas that includes camera, CPU and charging IC. The V20 is also the company first smartphone with a 48MP rear camera. Honor is using a Sony IMX586 CMOS sensor. The Kirin 980 chipset will offer a 48MP AI HDR mode to offer high definition images. There is also a secondary ToF (Time of Flight) camera on board to obtain depth information. The V20 houses a 4,000mAh battery with super fast charge support and ships with Android Pie with Magic UI 2.0 on top in China. Globally, the phone will ship with EMUI 9.0. Honor is also introducing a new technology in the V20, called Link Turbo. This technology aims to improve connectivity by seamlessly switching between Wi-Fi and LTE depending on the task. The Honor V20 has been priced at CNY 2999 (approx NRs. 48,750) for the base variant with 6GB of RAM and 128GB of internal storage. The phone will also be available with 8GB + 128GB priced at CNY 3499 (approx NRs. 56,880 ), respectively. 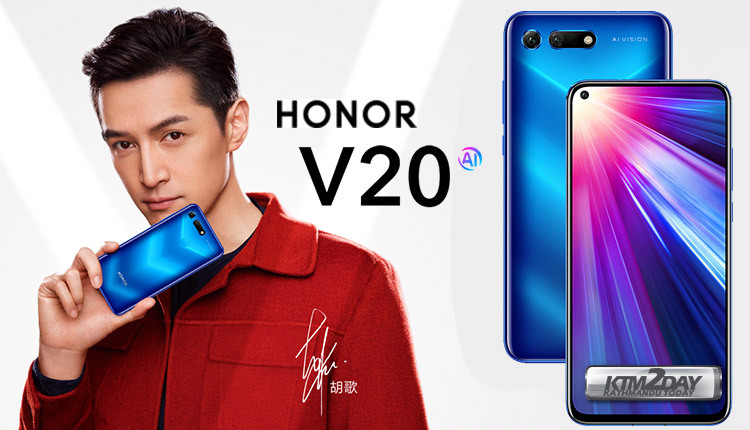 Honor has also launched a special Moschino brand edition of the V20 in China with 8GB + 256GB configuration proced at CNY 3999 (approx NRs. 65,000). 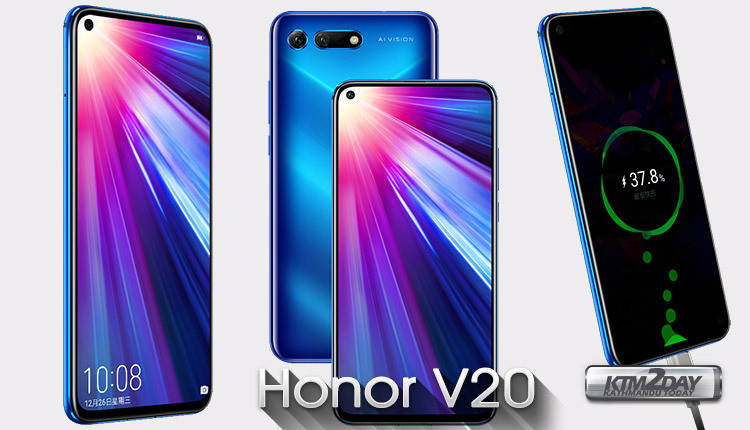 Honor has set a global launch for the new flagship in Paris on January 22 where the device will be called Honor View 20.